This is the first post in a monthlong series. Each post will take about two minutes to read and may include an action item that takes the reader another two minutes to complete. I am writing this for an audience of people who know nothing about frequent flyer miles, and my goal is that by the end, you know enough to fly for free anywhere you want to go. Frequent flyer miles are your ticket to travel more, better, and cheaper. 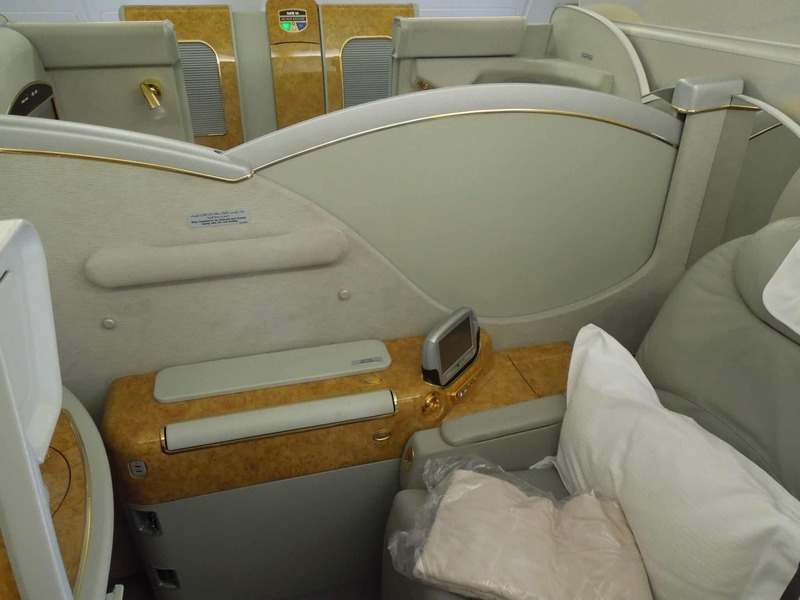 Mastering frequent flyer miles, hotel points, and credit card programs truly is life changing, so I am revising and updating my Free First Class Next Month series for beginners, which I first ran in March 2012. Frequent flyer miles from travel credit cards have allowed me to visit nearly 50 countries at the age of 27, with enough miles left over to go anywhere in the world tomorrow if I wanted to. I pay less for these trips than you probably did for your last vacation, and I’m usually flying in Business or First Class. When I say “First Class,” I’m not talking about those slightly wider seats at the front of the plane you see as you board your flight to Cleveland. International First Class means your own fully flat bed in your own enclosed suite while being waited on and served fine foods and wine. My suite in Emirates First Class. My personal mini-bar pops up. The seat turns into a flat bed, and a few minutes after taking the photo, I took a shower eight miles high. I’m not writing this to brag. I’m writing because my techniques are very easy to repeat. For instance, MileValue’s Rookie Alli went from having no frequent flyer miles to flying in a fully flat bed internationally in just four months. She used to fly economy like you. Luxury is attainable with frequent flyer miles, and it usually costs far less than a paid ticket. I flew in Cathay Pacific First Class for the miles I had gotten for opening one credit card plus $43 out of pocket. Do you have $43? I know for many people luxury travel is not the goal. They just want to get their family on vacation or to visit grandparents, and they don’t have the money in the budget for these trips. These techniques can also help a family travel for peanuts. I recently described how a family of four could fly to Europe for only $274 total! What’s the catch? You’ll have to learn a few things and open the right credit cards. In this series, I’m going to be showing you the tricks that experts use to fly in First Class anywhere in the world for pennies. By next month, you’ll be a pro at earning frequent flier miles for doing things you already do and redeeming them for dream first-class vacations you thought you could never afford. In addition to frequent flyer miles, I’ll be teaching you about how to find incredibly cheap cash fares and hotels, so that you’ve got a full arsenal of ways to travel cheap or free. Forward those emails to your friends, so they can also learn and become your travel companions. For those who can’t wait until tomorrow, here is a link to every post in the last series. This series will follow roughly the same topics.